A paper published today in Global and Planetary Change finds high rates of sea level rise along certain sections of the coast of Thailand are almost entirely due to "extreme land subsidence" [land sinking] rather than global warming. The authors find sea level rise increased significantly after the 2004 Sumatra Earthquake which greatly increased land subsidence in certain regions, and that rapid land subsidence is also due to groundwater extraction. Relative sea level change is primarily related to subsidence or post-glacial rebound [land height changes] rather than melting ice or steric sea level changes [thermal expansion from warming]. Global mean sea levels are rising at only about 1-1.6 mm/year, equivalent to 4-7 inches per century and without any evidence of acceleration. Without acceleration, there is no evidence of any human effect on global sea levels. Sea level rise is primarily a local phenomenon primarily due to land height changes rather than global warming. The study addresses two important issues associated with sea level along the coasts of Thailand: first, the fast sea level rise and its spatial variation, and second, the monsoonal-driven seasonal variations in sea level. Tide gauge data that are more extensive than in past studies were obtained from several different local and global sources, and relative sea level rise (RSLR) rates were obtained from two different methods, linear regressions and non-linear Empirical Mode Decomposition/Hilbert-Huang Transform (EMD/HHT) analysis. 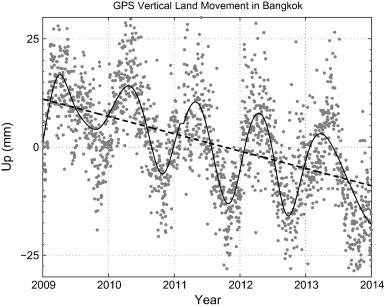 The results show extremely large spatial variations in RSLR, with rates varying from ~ 1 mm y− 1 to ~ 20 mm y− 1; the maximum RSLR is found in the upper Gulf of Thailand (GOT) near Bangkok, where local land subsidence due to groundwater extraction dominates the trend. Furthermore, there are indications that RSLR rates increased significantly in all locations after the 2004 Sumatra-Andaman Earthquake and the Indian Ocean tsunami that followed, so that recent RSLR rates seem to have less spatial differences than in the past, but with high rates of ~ 20-30 mm y− 1 almost everywhere. 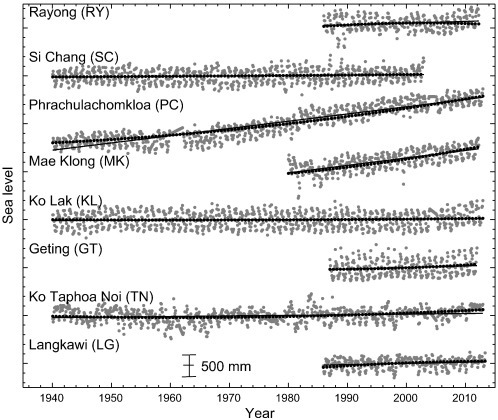 The seasonal sea level cycle was found to be very different between stations in the GOT, which have minimum sea level in June-July, and stations in the Andaman Sea, which have minimum sea level in February. The seasonal sea-level variations in the GOT are driven mostly by large-scale wind-driven set-up/set-down processes associated with the seasonal monsoon and have amplitudes about ten times larger than either typical steric changes at those latitudes or astronomical annual tides.